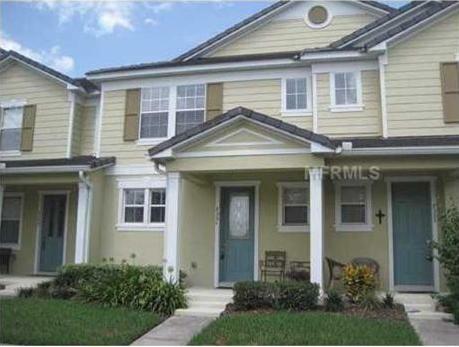 Beautiful Unfurnished 3/2 town home in the best location in entire community! This upgraded, sparkling clean unit with brand stainless steal appliances, brand new Fridge, Washer and Dryer located directly across from the park and the baseball diamond and is practically in Disney World's backyard! You'll love the spectacular nightly fireworks show from your master bedroom or front porch and fall in love with the nearly maintenance-free lifestyle you deserve. This home boasts one of the largest backyards in the entire neighborhood giving you more space than you'd find in any other home of this size anywhere. Inside you'll love the fabulously upgraded kitchen including stainless steel appliances, tile floors, and spacious first floor living/great room combination. Four ceiling fans help you keep your cool in style. Upstairs, you'll find three full bedrooms with a front master, separate walk-in laundry room and a million-dollar view of Lake Burden from the back bedrooms. Detached two-car garage offers privacy and convenience. Extra parking directly in front of home offers ample space for guests. And no other neighborhood can compare: multi-million dollar lakefront estates mixed with luxury town homes and a Windermere address nestled quietly out the back door of the world's number one tourist destination!! Reserve it today!